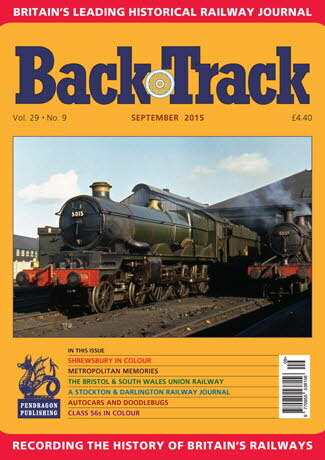 Railway Magazine | BackTrack September 2015 journal from Pendragon Publishing. West Riding - colour spread at various locations in the 1960s. Autocars and Doodlebugs - Roger Hennessey considers some Edwardian transfers of railcar technology. The Case of the Brightlingsea Branch Closure - E.A. Gibbins investigates the destiny of an Essex branch closed by floods in 1953, reopened then closed again in 1964. In Lincolnshire - three pages of archive photos from that county. By Train to Somerset in the 1960s - John Chapman recalls a youthful holiday journey. A Catalogue of Errors: The Stockton & Darlington Railway Journal of George Graham - George Smith uncovers some episodes from the early years of a pioneering railway company. Focus on Shrewsbury - four colour pages of this notable railway centre. Class 56 Freight - a colour spread by Rodney Lissenden. The Bristol & South Wales Union Railway and the New Passage Ferry 1857-1868 - a history of early arrangements for the Severn crossing. The Club Train 1889-1893: Part Two - Jim Greaves concludes his history of this early luxury train enterprise for cross-Channel travel. Things you don't see now! - some lost everyday sights photographed in colour by Paul Aitken. Metropolitan Memories - Michael J. Smith contrasts the now ubiquitous 'S' Stock with the variety seen 70 years ago.